My family is living in that strange transition between homes, schools, jobs and LIFE. I am a routine person because my kids need structure to thrive, those boundaries and expectations to keep their attitudes in check. Otherwise, they are a nightmare to parent. They act out, yelling at me and each other. I have started to resent their misbehavior as a personal attack on me. This is not true. They act out for different reasons like not enough sleep or feeling lost in the shuffle of our changing lives. As a mom it feels personal when they are screaming directly at me, as if I am to blame for all their problems. Which, by the way, are things like not getting another piece of candy. In those intense moments, I hate the person I become towards them- quick to anger, frustrated. As I reflect at the end of the day, I am ashamed at how many times I lashed out at them for their attitude. I don’t want to be responsible for my actions. I make excuses. If everything was the way it USED to be, I wouldn’t be like this. If my kids would just behave, I would be nice again. It isn’t my fault! If I didn’t have kids, I would be my usual fun self. I start sounding like my six year old. 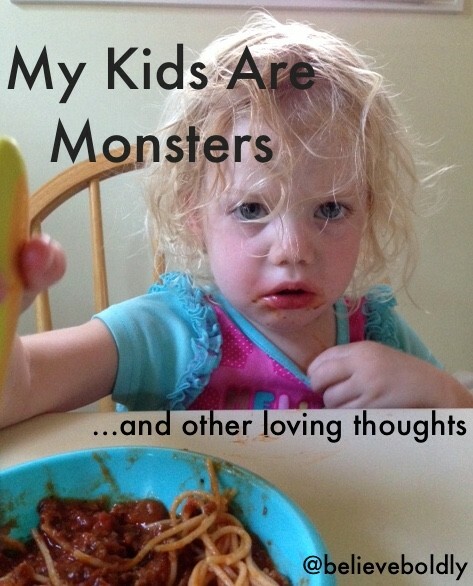 I have been evaluating my current life situation based on the belief that my attitude is just reflective of my horrible, selfish, little monster children, when it is really just a reflection of how I choose to react to them. There is no one else to blame for my change in attitude other than myself. As a mom, I cannot keep losing my temper. I am smarter than that! I cannot begin to believe that my life is better “without” my kids, even on my worst days. God doesn’t lose His temper with me. He doesn’t turn his back on me or wish I wasn’t born. He is patient and caring and always loves me, no matter what. I want to be all those things for my own children. Moms, I know you get it. Comment below and we can talk it out. What do you do to reset your attitude when you just can’t take anymore? What sets you off the most with your kids, and how do you keep your reactions pleasing to God? You may feel these things on the inside but as your children’s Lala I see a confident fun loving mama. The kids are so blessed to have you and Joey. I love your stories and I am excited to be a part of your journey. Nicely written, Erica. We’ve all been there. <3 It's not always easy to keep your cool in heated moments of frustration. Truth be told, we're all lacking a lot of the "me time" we used to have. We're sleep deprived. We're exhausted, and " barely" running on fumes at times. I truly believe that being self aware, and choosing to acknowledge (our own) poor behavior in these challenging situations, is the first step towards becoming the calm, and approachable parent we all strive to be. Sounds like you've taken those steps. Your children are blessed to have you. 🙂 Thanks for sharing. Thanks, Angie! I think, as moms, we should always be striving to be better, even when it is hard! I certainly don’t get it right every time, but I can tell a big difference when I start my day off with prayer and Bible reading. I am a whole new mama! Thanks for the encouraging words!